Our son visited us under the occupation and just left. We are grateful and energized by this visit (albeit short). The questioning both on entrance and exit totaling hours shows how callous such a colonial/apartheid system can get. At the airport coming in, the apartheid authorities even showed him photos of both me and my mother (his grandmother) asking him to identify us! At least he was let in though. We have many friends, relatives and colleagues who are denied entry by the fascist border officials. One colleague just denied entry Wednesday is a PhD student doing her thesis research on Israeli-Palestinian cooperation in nonviolent resistance! But these and other signs (e.g. the attack on the humanitarian aid ships in International waters and building walls, the denial of medical care except to those willing to collaborate with the occupiers) are signs of political Zionists reaching a dead end and thrashing about aimlessly. There are also signs of the beginnings of a new and now perhaps global intifada (uprising) against repression characterized by spread of information virally though the internet (bypassing the controlled "mainstream media") and by the spread of the boycotts, divestments, and sanctions movement (BDS, see bdsmovement.net). New Video of the latest demonstration in Al-Walaja, a village of over 18,000 dunums before 1948. Over 75% of its land was stolen and all its buildings were destroyed in 1948 as the natives were ethnically cleansed (500+ other villages and towns suffered the same fate). European Jews came to build a life on the destruction of other people's lives. 10% of the Palestinian refugees from Al-Walaja rebuilt their lives in the portion that remained free from occupation before 1967. In 1967, the area was occupied and the 25% of the land that remains was targeted to be colonized. Already 33 homes were demolished, 88 have pending orders for home demolitions, and the remaining homes are being surrounded by the apartheid wall isolating them from the remaining agricultural lands. In this demonstration 3 days before the Israeli "supreme court" is to rule on the wall path here, the villagers with internationals express their views of apartheid. 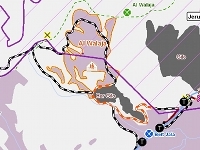 For a UN fact sheet on Al-Walaja, see here. And here is a video of a spontaneous dance flashdance that happened on the El Malha Israeli checkpoint between occupied Beit Jalla and occupied Jerusalem. Action especially for citizens of the UK: Reject the moves to change laws in England that would curtail possibility of prosecuting Israeli war criminals.